Conservation CATalyst has released a new video of a rare, wild ocelot living along the U.S.-Mexico border in Arizona. The cat was captured by remote-sensor cameras in an undisclosed location. A new video of a male ocelot roaming near the Mexican border in Southern Arizona has been released to the public to illustrate the value of the region’s biodiversity, says the conservation group that produced it. The nonprofit group Conservation CATalyst is also trying to call public attention to President Trump’s planned border wall, which it says could be “game over” for prospects to recover jaguar and ocelot populations in Arizona. The video combines three clips of the ocelot into one, 67 seconds long. Two clips are nocturnal shots. One shows the male cat walking past a yucca; in the other he’s sipping at a pond surrounded by snow. The daylight shot shows the ocelot walking past a pond, standing next to it briefly and leaving the camera’s range. Ocelots are listed as endangered in the United States by the Fish and Wildlife Service. The ocelot’s spotted coat serves as camouflage, and each pattern is so unique it can be used to identify individuals, much like a fingerprint, the group says. “We can tell all three video clips are from the same adult male ocelot. He is exquisite and is clearly thriving in the mountains of Arizona,” Neils said. The border wall is one of the biggest threats facing the cat because it would sever Arizona ocelots’ connection with Mexico, the group says. Other threats include habitat loss, poaching and poisoning. “If there was ever a solid physical barrier that spanned the entire border, as is planned by our current administration, it would be ‘game over’ for both jaguar and ocelot recovery in this country,” said Chris Bugbee, the group’s senior researcher. Q. When were the video clips shot? A. Within the past year, with the most recent clip shot this winter. A. All we wish to say is that they were shot in Southern Arizona, near the Mexican border, as close as less than five miles from the border. We intentionally made sure that none of the videos have anything in them to give away the location. We are being overly cautious, to ensure the protection of this incredible cat. Q. 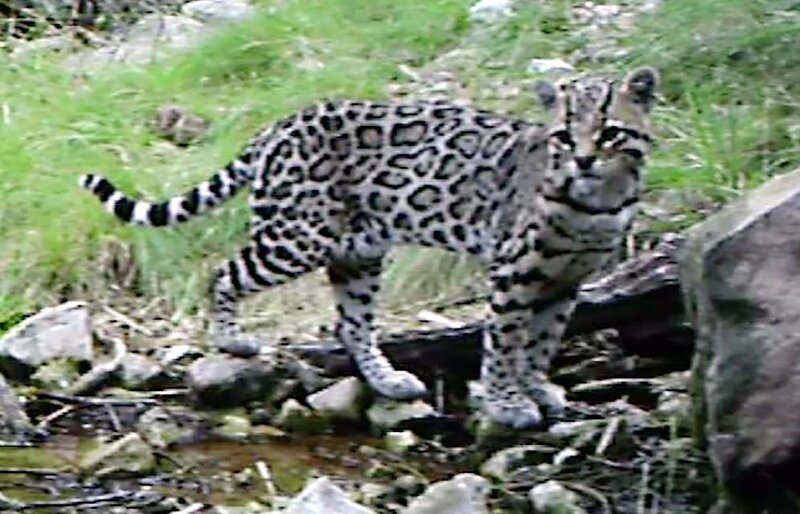 Both yourselves as well as federal and university researchers whose cameras have captured jaguars and ocelots in the past have disclosed the mountain range and the county involved. Is your decision to shield this ocelot’s location due to the emotional controversy over the wall? A. Yeah, it is a factor. It’s unfortunate, but it’s a fact that this wall issue has polarized Americans. It has created a scenario where we are afraid for this endangered species. We really want to be extra cautious. Q. Why have five ocelots been documented in Arizona in the last decade after so many years when none was seen? A. It’s probably a combination of factors. Many neotropical species like ocelots are extending their range northward, which is vital for conservation of the species. It could be a product of climate change. It also could be a product of the fact that many of these areas have been managed really well. It could be there is more prey and resources. The fact that people are becoming aware of the importance of predators, and that predator eradication campaigns have fortunately been reduced in most areas, that’s really important. There are also more trail cameras. There are more people out there, looking. Q. What can we do to make it better for ocelots? A. First and foremost, it’s not building that geographic barrier. Nothing will end ocelot recovery faster than the wall, period. Aside from that ... not building copper mines in their habitat, and making sure we have these incredible parcels of wild spaces. Q. Talk about the border wall’s importance to ocelots. A. We have two endangered spotted cats here, jaguars and ocelots. These cats are part of Sonoran populations. We need to stop thinking of these cats in isolation. If we are to truly save these endangered cats, then we have to manage them as one contiguous population. Otherwise, there is not a chance of recovering those jaguars and ocelots on American soil. To build a contiguous, structural barrier would probably be the end of these endangered cats in the United States, probably forever. A. There aren’t any female jaguars or ocelots we know of in Arizona. Even if there was one or two that we missed, it’s not sustainable. There just currently isn’t the genetic diversity in Arizona alone to be a long-term breeding population. It makes sense biologically that all five Arizona ocelots we’ve verified are males. Male cats disperse further than females. Males are also usually the first to recolonize former territory. Females typically take longer to expand into new areas. It’s a very good sign for the future of these cats that these males are coming. Q. Why couldn’t jaguars or ocelots climb over a wall, even one 18 to 30 feet high like the administration wants? A. Jaguars are not typically climbers. They hunt and do everything on the ground. Ocelots do climb, but they are climbing structures that aren’t perfectly smooth like the wall that would be built. Climbing something straight up at that height is highly, highly unlikely. Q. Wall supporters say we need it for the safety of people living and working along the border. A. I started hiking alone in the borderlands as a teenager. I’ve been hiking along the borderlands for 20 years now, and a significant portion of that has been with only my dog, and I feel perfectly safe there. We need to change the conversation about what the borderlands are really like. It’s no more of a risk than hiking in remote areas of California, or Montana. It always surprises me when people who have never been to these locations say how dangerous the border is. There are occasionally problems, but that occurs everywhere. Q. Southern Arizona’s mountainous areas don’t show up on the Trump administration’s priority list for wall locations. The most recent appropriation will build fencing in Texas. Does that encourage you about the big cats here? A. First, this wall is setting a dangerous precedent. Also, there is a small population of ocelots in Texas that is reliant on Mexico. There are so many other endangered and protected species in Texas, directly under threat right now. Q. Are there any walls or human-built barriers in the areas near where this Arizona ocelot was videoed? A. No, there are barriers, but not contiguous human barriers yet. That’s why we still have ocelots. Q. Would vehicle barriers on the border that are shorter than the wall work for the ocelot? A. I’d have to see them to be able to speak more adequately to them. If they are shorter, that’s better for wildlife. But the cats are highly secretive and elusive. In areas with walls or other structures, they (federal workers) often bulldoze and clear entire vegetation. They also have lighting. Cats are nocturnal. They move under cover of vegetation. By just clearing that out and adding lights, that in itself is enough to be a barrier to some species. Two former players were expelled and a student staffer was suspended but allowed to graduate, documents show.